*For 25 years, Barbara Wein served as Executive Director of the Golden Gate Council of Hostelling International-USA, based in San Francisco. She shepherded the Redwood Hostel into being, back in 1986. 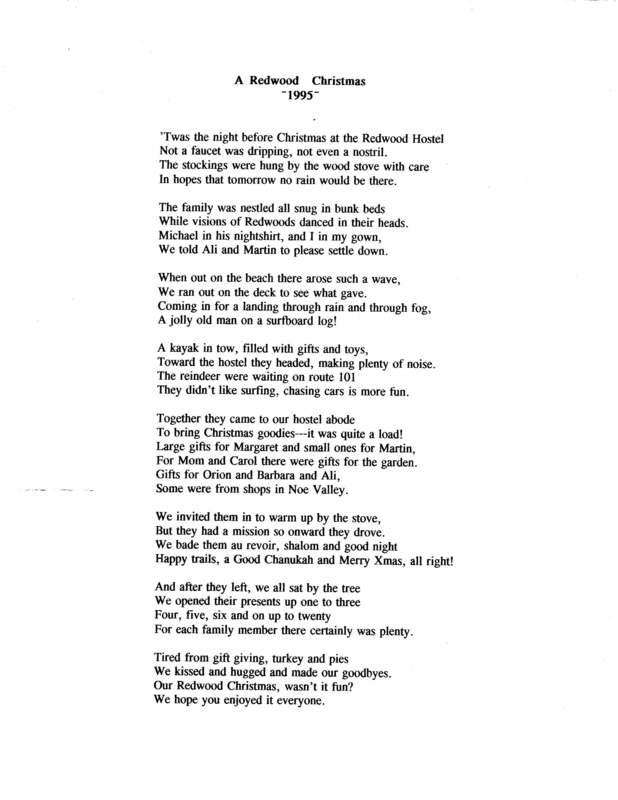 At the time she wrote this poem, she had agreed to caretake the hostel after a federal government fiscal crisis required the hostel to close temporarily (Redwood Hostel was a concessionaire of the National Park Service). She recently found this poem, and we are glad for it. A palm-size group of hostel staff and members of the Crescent City community built up not one, but TWO labyrinths on November 2nd! See our photos here and the original posting through this link. Just about every day we get to meet new people. And just about every day, we have to say good-bye to others. Sometimes hostellers return, but it seems more often that we never hear from them again. But sometimes we do. A week or two back, one of our recent hostellers emailed us to share the photos she took during her stay a few months earlier. In her note, she wrote, “Just wanted to tell you how much I enjoyed my stay with you in June. My first hostelling experience couldn’t have been better!” We liked the photos so much that we asked her if we could share them with others, and she very kindly said yes. Thanks, Danielle! So here is a glimpse of just one person’s experience in Redwood National Park–from the ocean and the trees to–yup–Redwood Hostel. Of slugs and rivers…and chocolate! Here at the Redwood Hostel, we offer several goodies for sale, including our own line of chocolates. Okay, they’re actually made by Sandy and Michael, the great people of Drakes Glen Creations, but they do let us design our own labels. For our latest two chocolate bars, we are honoring two famous local attractions–the ubiquitous banana slugs that make their way across many of the trails out here; and the Klamath River, second largest river in California, the mouth of which meets the Pacific about 5 miles south of the hostel. It’s 8:45 and the hostel is absent of light from the grid. (Except for those pesky hall lights that won’t turn off-but that have made us more conscious about fixing them!) Most everyone staying here tonight is huddled around the Monopoly board and a small set of candles; the darkness bringing them together. I can hear laughter from the other room and it’s refreshing to my ears to hear people of all ages sharing a good time. This is the hour of the Earth, for the Earth. A reminder that we don’t need electricity to have a good time. This is a global movement that started last year in Sydney, Australia and has expanded to include over 200 cities around the world. We earthlings are making a statement: We are saying that we care about this Earth who nurtures our souls, feeds our bodies, and shows us her mysterious ways. She has gifted us all that she can, and we revere her for this. As I am sitting in the office, working by candlelight, I get a call from Lesley, who is in Chicago, and just participated in Earth Hour as well. I am overjoyed to be connecting with someone who is thousands of miles away and is expressing the same message as I am. It gives me hope that we can all come together, for the love of each other and for the love of the Earth and put a serious holt on climate change. …Watch yourself from day to day. Is global warming a part of your consciousness as you are leaving a fully lit up house for a few hours? Are there any appliances that you can unplug after using them? It may not seem like a lot, but every bit of energy you save is drastically helping Mama Earth in her recovery. Let her enter your mind, your heart, your spirit…Join the cause, we can really use your help! Enjoy! 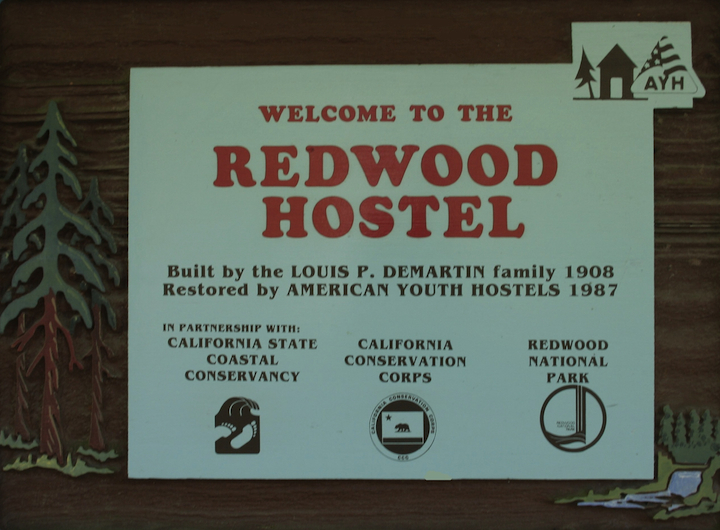 If you’ve any you’d like to add, please email to info@redwoodhostel.org…blessed be! The annual Northcoast Redwoods Writers’ Conference will be here soon, September 14 and 15. The event begins Friday at either 4:00pm (if you select the optional critique session), 5:30pm (if you want to attend the booksigning), or 6:15pm (for the welcome and opening panel discussion). Saturday’s sessions run from 8am-4pm-ish and include a keynote speaker, readings, workshops, and an open mic session, not to mention the continental breakfast and catered lunch. Though I guess I did just mention them. Once again we here at Redwood Hostel are back to working every day. Yes, after the cold winter months of confusing hours (if it’s Monday, we must be closed–oh, unless it’s a holiday), we are now open seven days each week. As of March 1, and continuing at least through October (we reserve the right come November or December to take a few days off), if it’s a day of the week, one or more of us will be here to welcome hostellers. So let there be no mistake: we’re open. After a month of down time, Redwood Hostel is again open for business. January uusually sees lots of rain and very few travellers, so hostel management decided to go south for the winter–three weeks in central America. But now that we’re back, we’ve learned there wasn’t much in the way of rain in these parts. Ah, the beaches…the Redwood trees…the rivers…the free WiFi at the coffee shop. It’s great to be home! Oh! Just an FYI: through February, the hostel will be closed on Monday, Tuesday, and Wednesday nights. But we’re open to any and all on Thursday through Sunday nights. And come March 1, we return to our regular schedule of being open 7 nights/week. What an amazing place this hostel is. Worries seem to vanish when one can plop an elbow on the deck’s railing, sip from a hot cup, and watch the sun delicately slip into the Pacific. Indeed, I’m afraid coffee breaks will never be the same again. The Redwood Hostel experience, for the global connoisseur and first-timers alike, is one that must be included and checked off your “to-do.” Each night, much like each day’s weather, has a different feel. Guests include young travelers, old travelers, families, and couples, international and domestic, all in coexistence. It really makes me smile when I walk into an aromatic kitchen and find a group in conversation speaking a language I don’t understand. On several occasions, I have been invited to share an evening meal with hostellers or join in one of our many board games. 1. What is your favorite hike? By a good measure, my favorite is the Damnation Creek trail. It’s a 2 &frac12; mile trail that has a 1000 foot elevation change. It hikes from the redwoods, through coastal evergreens, and down to a rocky coastline where often it feels like your own private beach. There is even a little secret spot I have discovered and passed on to the managers of the hostel. If you walk north on the beach another half mile, there is a section of rock that has a little tide pool if you time your trip right. The hike back up 1000 feet lets your body know that you’ve been hiking- it’s invigorating. The whole trip, including taking your time once on the beach, is about 3 hours. 2. What food items do you recommend from the office store? We do sell a few high-carb items such as pasta and rice- which are both tasty. Also, we sell many snacks that get the job done as well. But, beyond any comparison, the finest item for sale happens to be “The Mark Bar.” Yes, I created my own chocolate bar for the Redwood Hostel. This brain-child of mine is currently the top seller in the store. It is a dark chocolate bar with real Kona coffee, toffee bits, and cashews. This hostel is the only place to find such a sweet-tooth-satisfier. I want to say a special thank you and goodbye to the managers Kaci and Ryan. Your family brought a sense of genuine welcome to me, which is felt as well by each visitor that walks through the front door. You make this hostel feel like a home away from home and I thank you for helping to make this summer one of my best yet. Goodbye Redwood Hostel. I shall return.